The metal tin comes in a 3.5 oz (100 g) size. Label on the front is a sticker with the brand’s name on. The bottom contains a sticker with info on the company, the tin’s size and ingredients list. Unscrewing the lid, you encounter a light yellowish pomade. My hair: medium thick, wavy, somewhat unruly hair of medium length. Wear a contour. My styling equipment: boar hair brush, Denman brush, detangler (Tangle teezer), and Bixby comb. Use brushes most. Petrolatum, Cera Alba, Glycine Soja Oil, Prunus Amygdalus Dulcis Oil, Juniperus Communis Oil, Linalool, Limonene. Glycine soja (soybean) oil: soybean oil obtained from the glycine soja plant. Prunus amygdalus dulcis oil: sweet almond oil. Juniperus communis oil: juniper essential oil, among other things used for the smell. Linalool, limonene: fragrance ingredients derived from natural or synthetic origin. I assume Pompy’s uses natural sources, given their profile. Juniper. Smells strong in the jar. When applying, you get herbal whiffs of the juniper. Once it was in the mop, I didn’t experience any smell anymore. For me personally, this is not a problem, don’t dig overly strong smells. I like the fact that Henry uses juniper essential oil as it has therapeutic power for the hair. Application: on damp hair, my usual habit (to tame my waves and to avoid tugging and pulling). 3 normal licks in the bangs and ready to start. Scooping: have to push with some force at the top layer before it comes out. Beneath the top, softer to scoop = story we are used from stronger pomades. Breaking down: rather thick and after a few thorough mixes between the palms, you feel a creamy, petro substance that’s not that heavy in the wax department. It doesn’t feel sticky or greasy either. No dry sensation. Working in: no pull and tug, goes in facile + comfortable, spreads well evenly = as a medium hold. Combing back: little to no resistance using my Denman brush. Switching the hair’s position and styling a clean part was easy to do too. Control: Pompy’s provides you with a good, balanced control. It laid down the hairs at the sides and rest nicely and kept them in place, not that feeling your hair is being pushed in any direction. My cowlick stayed down and my waves weren’t present, even after a few re-combs. There’s no stickiness but Pompy’s held everything well together. No stray hairs to discern. Weight: light to medium. Volume and height you get with this pomade is very decent. Styling time: average. Went quicker on the second day. Initial results: my hair looked okay, clean enough but I wasn’t sure whether it would keep its shape. Height: okay. Shape: sufficient. Had to re-comb my front several times. My waves did not show up immediately. Results after 30 minutes: some tiny sag of the front and a few waves coming through a tad = nothing to worry about and ready to hit the road. Medium, they say. Nice in the middle kind of sheen yes. No fading out of the shine. Described as a strong hold or a firm hold as some call it. To me firm is the midway between a medium and heavy hold. In my hair, Pompy’s strong hold is more of a solid medium hold. While using it, I had the impression it being a medium all the way. On top of that, it gives a strong and balanced control that allows nice results. Tested it in: temperatures around 70, some tiny sun, some wind, a walk, no heavy-duty. But, for my hair, I need a pomade with more hold. Pompy’s ‘the beast’ and ‘the beast II’ are the possible answer (these are super heavies). 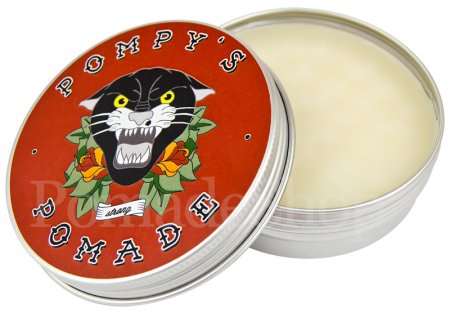 But, if you are in need of a balanced (solid) medium strength, Pompy’s strong hold is a good option for sure! Easy thing: no resistance. A little drop of hold. My mop still looked clean and neat enough and it staid that way. Clean and easy to work with. Build up for me is: adding some water and hair tonic, 2 scoops and style. I got more hold with fewer waves, much better look. This pomade does a good job in the build up department! 2 or 3 washes with shampoo, washes out easier than most petro based pomades. That’s a nice thing! Type of hair + shampoo, amount of it and present build up also determines the ease of wash-ability. After I rinsed, my hair felt soft and healthy. Rogue sideshow H/H (heavy/heavy or very heavy hold), an oil based pomade which was more of a medium-light for me. Wish it had more hold, more of a real strong hold. But to fulfill that, there’s Pompy’s the beast. I like the very subtle scent, ideal for people that don’t like overbearing smells or are allergic to them.